Manufacturer of a wide range of products which include adjustable micrometer spirit level, block levels and clinotronic plus. 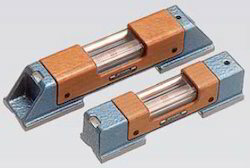 We are distributor & trader of Adjustable Micrometer Spirit Level. We are distributor & trader of Block Levels. We are supplier & trader of Clinotronic Plus.The +CLINOTRONIC PLUS+ provides a measuring capacity of ± 45 degrees or alternatively ± 10 degrees respectively ± 30 degrees. Four precisely machined exterior reference surfaces assure accuracy and repeatability of measurements in any quadrant. Selected by push-button, any units suitable for inclination measurement may be applied to the display. Even slope indication based on a relative base of selectable length is possible. Simple push-button operation automatically sets absolute as well as relative zero. The RS 485 interface allowsthe connection to other WYLER instruments or directly to a PC using a special cable. All indicated values are, by interpolation of calibration values stored, computed prior to display. If required, an integrated calibration mode may be actuated in order to replace the stored calibration data. 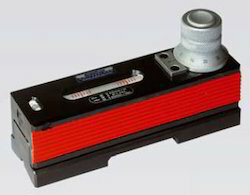 For this purpose, the +CLINOTRONIC PLUS+ ± 45° must, with the aid of suitable equipment, be accurately inclined, using 5 degrees steps over the range of ± 50 degrees.The measuring principle is based on a differential capacity measurement of a pendulum providing excellent repetition, hysteresis as well as start-up behaviour. Combined with a complex evaluation algorithm this forms the base of an high quality hand-held tool. Response time: Value available within 5 seconds. Temp, coefficient: Less than 0.01°/°C. Temp, range: operational 0 to 40°C.